Cienfuegos is about 150 miles southeast of Havana, approximately 3 hours by car. The main highway between the cities is in decent condition and since most locals don't have cars, there's no traffic. Living in LA, that was a real treat for me. The only real traffic you may encounter is the 4-legged variety. We had one stand off with a horse, but it didn't last long. Do pack your own snacks and water as the drive isn't exactly chock 'o block with 7-11 type convenient stores, but there are a few open-air spots to pull over for a bathroom and casual bite. Cienfuegos is known as la Perla del Sur, or the Pearl of the South. It's a smaller port city on a bay. French immigrants settled here in 1819, so naturally I thought it would be the perfect stop for me and my friends from Paris. There are some French touches in the colorful architecture, but it also still holds a strong Cuban flair. There's only about 150,000 people living in Cienfuegos and for the most part, it's a pretty sleepy little town. Parque Jose Marti is the name of the square in the middle of town. It's also where you can find wifi. You always know where wifi is by the large clusters of people gathered together, looking down at their hands. There's a mini Arc de Triomphe in the Parque, un petit nod to Cienfuego's French past. You'll find a yellow Neoclassical cathedral off the square, along with Teatro Tomas Terry, a cute little theatre that dates back to 1889 and often has dance or musical performances. A few doors down is Centro Cultural de las Artes Benny More. 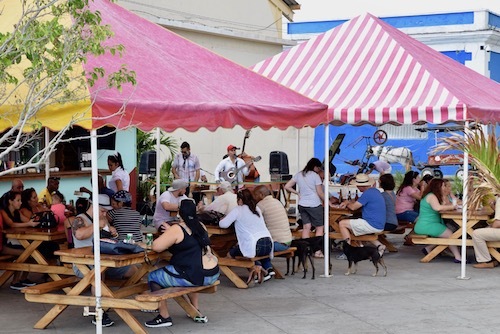 There's live music playing there and you can dance, eat, and drink while taking it all in. Just off Parque Jose Marti is a cobblestone street selling souvenirs in carts and small shops leading down the water. Most of the items are similar, so find what you're looking for and don't be afraid to bargain. Galeria Moroya is also a nice gallery also just off Parque Marti with some higher end crafts, clothes and sculptures. The major street through Cienfuegos is Paseo del Prado where restaurants, art galleries and beautiful multi-colored buildings are all lined up next to each other. There are benches and trees in the pedestrian friendly walkway down the middle of the street. 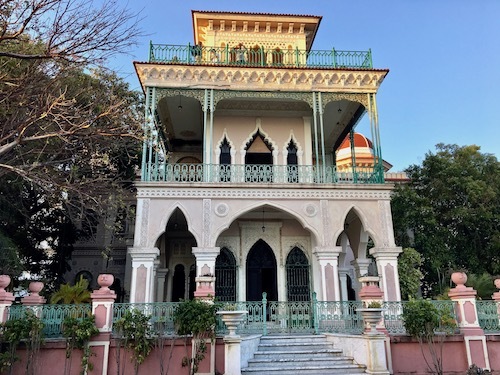 It's a great place to take in the pretty pastels of Cienfuegos. If you keep walking down Paseo del Prado, you'll hit the water and eventually picturesque Punta Gorda. You can grab a horse-drawn carriage down there and save your feet for walking around the pretty neighborhood. We did a little of both. Huge homes are scattered across Punta Gorda, where the sugar barons used to take up residence. Time your Punta Gorda walk so you can have a sunset drink at Palacio de Valle, a grand mansion with a rooftop deck and sweeping water views. We were also treated to live music while orange and pink filled the sky. We weren't ready to leave the area so we dined downstairs in the well equipped restaurant. And like I said in my Havana post, the food is all very similar in Cuba, so go for atmosphere like the one you can get at Palacio de Valle. Las Mamparas is another well-regarded restaurant in Cienfuegos. The prices are inexpensive and the portion sizes are generous. We didn't have a chance to dine here ourselves, but the restaurant receives favorable reviews. We chose Casa Prado for their rooftop deck and were only going to stay for a drink, but once the music started and we began enjoying the enormous, refreshing daiquiris, we decided to stay for dinner. 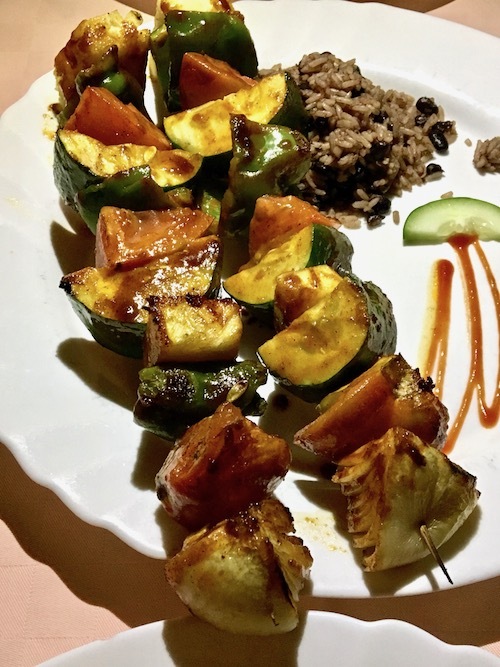 I was happy that they actually had vegetables on the menu since I was feeling deprived since Havana. I enjoyed my fish dish as well, but that night, I got horribly ill. I don't know if I can blame it on Casa Prado as my two friends had no issues, but I wanted to provide a heads-up just in case. Luckily I rebounded the next day for our afternoon at El Nicho Waterfall. Up next! Want to read up on the rest of my trip to Cuba?